Kid Wood Rolling Pin, Hand Wheat Grinder. Child Rolling Pin for small hands. Great Hand Wheat Grinder, easy to use, Good quality wheat grinder. Wheat Grinder and corn bean auger. 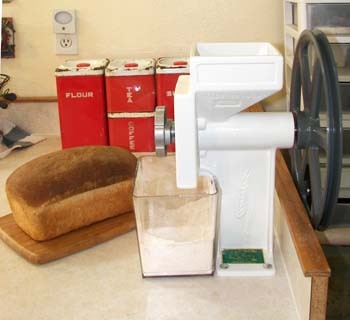 Hand grain mill that can easily be converted to electric. Industrial grade ladyrinth grooved sealed bearings, cast iron flywheel and lifetime guaranteed. Rated best in the world by two consumer magazines, East west journal and Inventment advisor. Bread in the picture above is from the wheat grinded on this mill. You may also get a wood hopper lid to cover the wheat and corn grinder when not in use. We left it open so you could see the mill. Questions? Call us at 435-648-2141. Kids Rolling pin & Pastry set with small rolling pin that will last for generations. 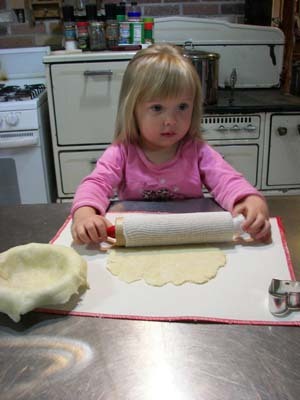 Little hands can roll out their cookie or pie dough with their very own rolling pin. Comes with removable cloth cover for rolling pin. You will have your best helper in the kitchen! Wheat Grinder or Corn - Bean Auger is FDA approved food-grade powder coating finish. Powder coating cast air craft aluminum. Build for hand milling, but easily motorized with High-carbon steel grinding plates. Notice how fine the wheat flour is grinded to. You may adjust it if you want a coarser grind for wheat cereal or the fine wheat flour for all your special recipes. 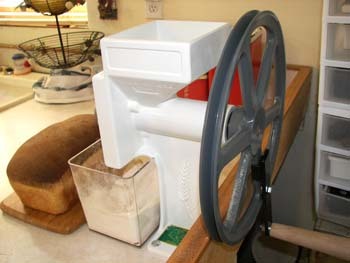 Bolt your wheat grinder to an area on your counter top or you may get a Wall mount kit to put your grain mill on. The Motorization kit comes with a board to put your wheat grinder - corn bean auger on. Small hands can enjoy cooking with you. 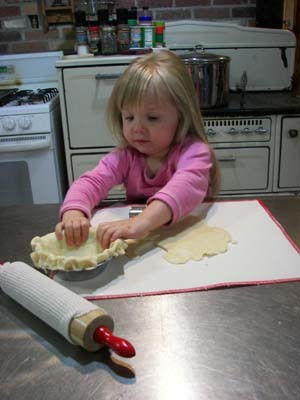 Your little one will enjoy their own little rolling pin that fit their small hands. 4th of July Bib #3016 $9.95 or buy 2 bibs that can be diffeent bibs $9.49 each. 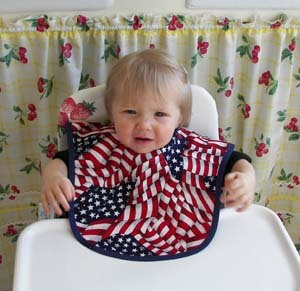 4th of July baby bib. This beautiful flag bib with easy snap on the back has pretty red and white gingham on reversible other side. Easy washable material.